Growing up my mom was the kind of mom that rationed the sugar. I studied the ingredient statements on boxes in the cereal aisle at the grocery store with serious determination as I was only allowed ones whose first ingredient was not sugar. This is harder than it might sound. My options were pretty much limited to the plain Janes – Chex, Cheerios and Rice Krispies. When I went to sleepovers, my friends’ parents must have thought it was strange that I was more than happy to have Lucky Charms, Fruit Loops and Cookie Crisp – and multiple bowls of them – for breakfast, lunch and dinner. The same applied to snacks. Candy was a special treat. But we had apple trees and apricots; peaches and cherries. We grew strawberries and raspberries and grapes. We were our own farmer’s market, eating primarily out of the garden in the summer and canning and freezing for the rest of the year. 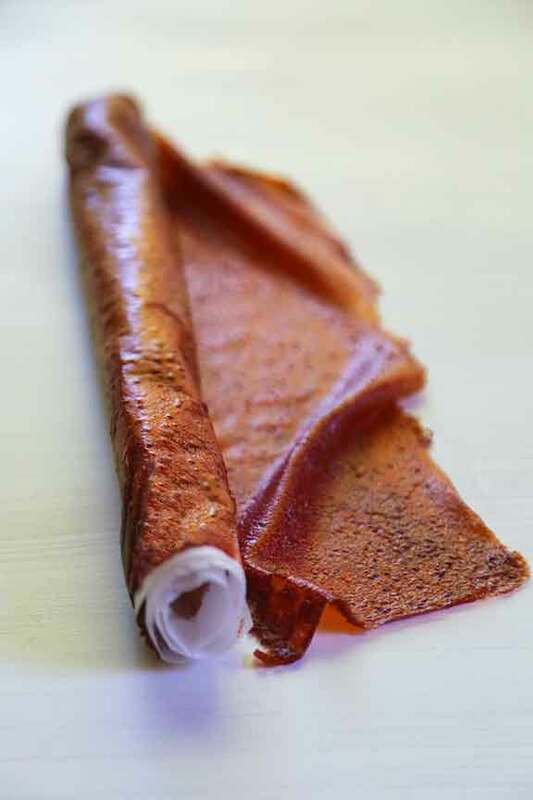 One of the treats my mom made that I loved was fruit leather. She’s 86 now and when I asked her for the recipe, she couldn’t quite remember, so I went looking around the internet and found this version on Epicurious. 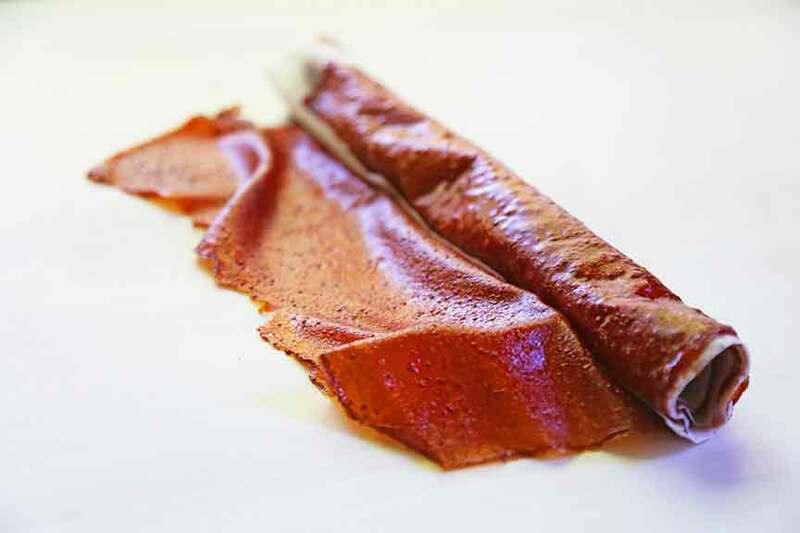 As a kid fruit leather was fun to eat – pulling stretchy, slightly sticky pieces from a big sheet – and so full of deeply saturated fruit flavors. Turns out it’s pretty fun to eat as adult too. Purée strawberries with sweetener in a blender until smooth, then strain through a fine-mesh sieve into a large heavy saucepan. I personally don't mind the seeds so sometimes I leave them in. Preheat oven to 200°F with rack in middle. Line a large baking sheet with nonstick liner (like a Silpat). Pour hot purée onto liner and spread thinly and as evenly as possible into a 15- by 10-inch rectangle using spatula. Dry purée in oven until it feels dry but is still slightly tacky, 2 to 3 hours. It shouldn't stick to your fingers. Place a sheet of parchment paper over leather, then peel leather off liner and roll up in parchment. 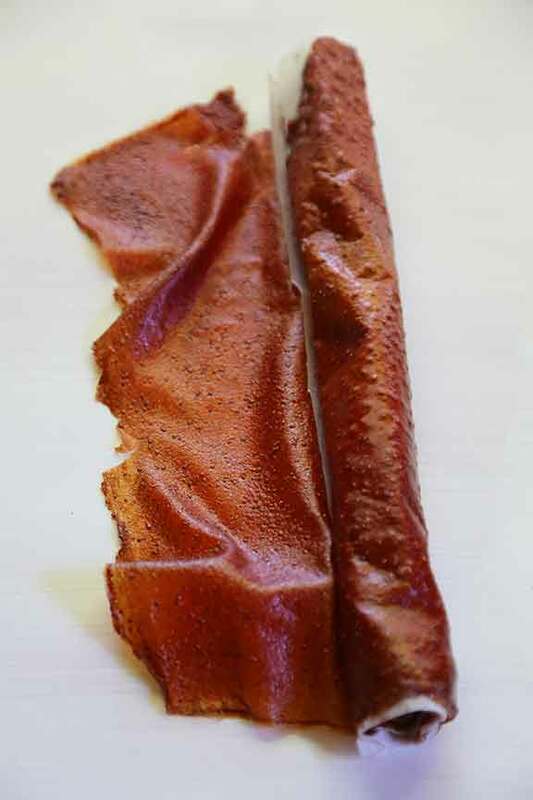 Strawberry leather keeps in a sealed bag at room temperature 1 month. Love it! Sounds like my childhood, too 🙂 Wouldn’t change it for anything. Fun treat, here! My mom used to make one with apples and lots of cinnamon. I’m thinking it’s about time to trot that one out again too! Have a super day Patricia and thanks for the comment.